Three Castleford Tigers under 19s players have been selected in the Yorkshire Academy ‘Origin’ squad to face the Australian Schoolboys. 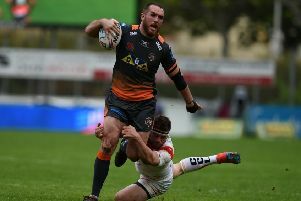 Lewis Carr, Lewis Peachey and Robbie Storey are all included along with former Castleford player Callum McLelland, who is now with Leeds Rhinos, who have eight representatives in the Yorkshire squad. Former England and Huddersfield Giants player Luke Robinson will coach the Yorkshire side against the visitors. The Yorkshire division take on the Australian Schoolboys at Castleford’s Mend-A-Hose Jungle ground on Wednesday, November 28 (kick-off 7.30pm). Lancashire are also playing the tourists before England Academy will then take on the Australian Schoolboys at Leigh Sports Village on Saturday, December 8 (2pm) and the Emerald Headingley Stadium on Friday, December 14 (7.30pm). Squads for the England Academy fixtures will be announced later this month.